The lights dim down, the projector hums, and suddenly a screen nearly five stories high transforms into a razor sharp canvas full of dazzling images -- a gigantic window into extraordinary sights and sounds that takes audiences on deep sea adventures, cave diving journeys, and aerial treks through massive canyons. For fifty years, MacGillivray Freeman Films has been flooding IMAX screens with beautiful, educational documentaries filled with impressive footage, and now ten of their bestselling titles have been packaged together for this 50th Anniversary Blu-ray Collection. While their content tends to be a bit light and simplistic, and even a big-screen HDTV is no match for a real IMAX theater, these discs are all enjoyable and even occasionally breathtaking pieces of filmmaking. The set includes: 'Arabia - 3D,' 'Coral Reef Adventure,' 'Dolphins,' 'Grand Canyon Adventure: River at Risk,' 'Greece: Secrets of the Past,' 'Hurricane on the Bayou,' 'Journey into Amazing Caves,' 'The Living Sea,' 'The Magic of Flight,' and 'Mystery of the Nile.' For full reviews of 'Greece: Secrets of the Past,' 'Mystery of the Nile,' and 'Arabia - 3D' please click their respective links. The remaining titles will all be covered below. Focused on the world of aviation, 'The Magic of Flight' enlightens viewers on the mechanics of flight along with lots of thrilling aerial footage and POV shots taken directly from the cockpits of Blue Angel stunt pilots. We get some background history on the subject, including a quick rundown of the Wright Brothers' first flight, and even get to tag along with the Blue Angels as they train for an air show. The doc isn't terribly in depth, but the stunt choreography is very impressive and narrator Tom Selleck does a solid job spouting out various facts about planes and flying. Though, on the other hand, what's the point of having Tom Selleck's involvement in a film if you can't even see his mustache? As far as I'm concerned, that's just a waste of classy facial hair! 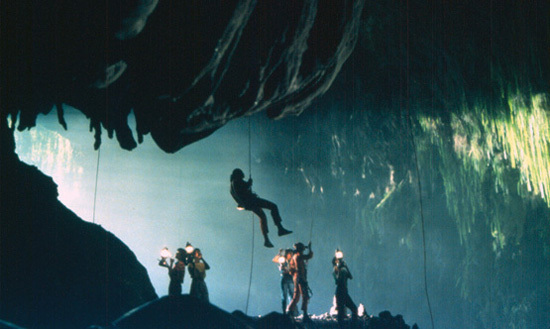 Segueing from the air back down to the ground, 'Journey into Amazing Caves' takes audiences on a harrowing expedition into a variety of dark and spectacular caverns. Narrated by Liam Neeson, the documentary follows a group of researchers as they try to retrieve samples of living extremophile microbes and bacteria found in isolated mountains, ice, and underwater caves. Brimming with mesmerizing footage of intricately formed stalactites and stalagmites, the film highlights the awe-inspiring beauty of these remote and incredibly dangerous locations. For the set's first foray into the ocean, we head on a 'Coral Reef Adventure,' and are once again joined by the soothing Irish timbre of narrator Liam Neeson. Throughout the documentary, we are treated to facts about coral, sea life, and various dangers that currently threaten reefs. Calming and serene, the beautiful underwater footage is of course the real highlight, and the images don't disappoint, showcasing numerous colorful reefs and interesting fishes and ocean critters. Split between the land and water, 'Hurricane on the Bayou' spotlights New Orleans and the wetlands of Louisiana while also addressing the devastating effects of Hurricane Katrina. Shot before and after the infamous storm and featuring the vocal talents of Meryl Streep, the film focuses on musicians and ecological challenges, revealing the unfortunate consequences our actions and nature have had on the state's environment. Unfortunately, the film features a lot of recreated and reenacted footage for the hurricane and the emotional storytelling feels a little overproduced and artificial. Due to their often grandiose style, MacGillivray Freeman films tend to work best when they focus on imagery and locations, and the shift toward a more personal story here doesn't work nearly as well. For our second diving expedition, we once again return to 'The Living Sea,' and reunite with Meryl Streep's disembodied voice for more ocean facts and insights. And as a special added bonus, she's joined by the musical stylings of Sting! With Streep's calming voice, Sting's relaxing tunes, and more rhythmic underwater footage, this title proves to be rather hypnotic, and aims to illuminate our greater connection with the sea, both below and above the surface. 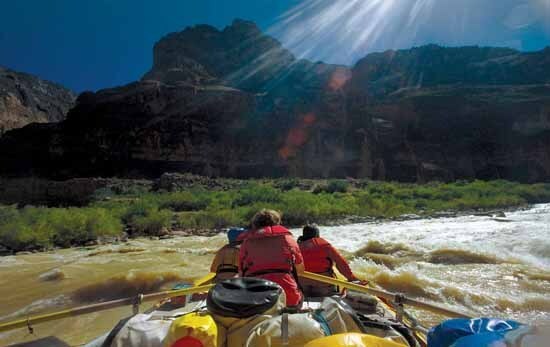 Acting as a sharp contrast to the peaceful, meditative currents found in the previous title, 'Grand Canyon Adventure: River at Risk' thrusts audiences on a wild rafting excursion through the Colorado River. Narrated by Robert Redford, the film once again focuses on a conservationist message, highlighting the river's unfortunately dwindling volume and the toll that climate change is having on the area. We also get some impressive white water rafting footage -- but while the footage can be thrilling, this is sadly one of the weaker inclusions here and proves to be a bit too simplistic. Finally, we head to the ocean one last time to play with a bunch of 'Dolphins,' and along with the lighthearted marine mammals we also get to enjoy more incessantly hummable tunes from Sting and the charming, debonair vocal talents of Pierce Brosnan. As one would expect, the doc is filled with lots of information about dolphins, highlighting their incredible intelligence, behavioral patterns, willingness to interact with humans, and amusingly paranoid sleeping habits (they sleep with one eye open). As a whole, these are all enjoyable films with a solid amount of educational information about their various topics. With that said, their dramatic, grand style can be a little overproduced, their short running times (about 40 minutes each) often limit their scope, their tone can be a bit too simplistic and family-friendly, and though the professional actors all do a great job with their voice overs, the various researchers, divers, and pilots also narrate portions of each film, and their readings tend to be comparatively stiff. Still, despite these flaws, the real draw here is the breathtaking IMAX footage itself, and in that regard, these films don't disappoint. The documentaries all work best when they simply let their incredible images speak for themselves, and at times they really can have a hypnotic and mesmerizing quality -- even if your screen isn't five stories tall. Image Entertainment brings 'MacGillivray Freeman 50th Anniversary Limited Edition Gift Set' to Blu-ray in a cardboard box that houses ten separate keepcases with each individual movie (presented exactly as they would be if purchased separately). After some warnings and logos, the discs transition to standard menus. All of the movies are provided with 1080p/AVC MPEG-4 transfers in the 1.78:1 aspect ratio, with the exception of 'Grand Canyon Adventure,' 'The Magic of Flight,' and 'Journey into Amazing Caves' which use the VC-1 codec. 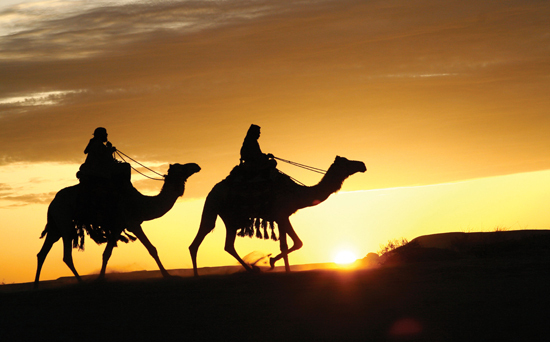 Additionally, 'Arabia - 3D' is presented in 3D with a 1080p/MVC MPEG-4 transfer. For detailed video write-ups on 'Greece: Secrets of the Past,' 'Mystery of the Nile,' and 'Arabia - 3D' please see their full reviews. For the most part, all of the remaining films feature very similar strengths and weaknesses, so I will be summarizing the video presentations together while pointing out any specific quirks as necessary. Shot with IMAX cameras, these films all offer truly breathtaking cinematography and incredible footage of amazing locations and scenery. From coral reefs, to vast canyons and underwater caves, the imagery is truly spectacular and detail remains strong throughout. 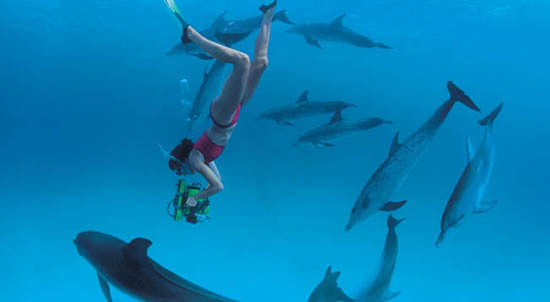 Of the group, 'Coral Reef Adventure' and 'Grand Canyon Adventure' prove to be the most impressive, with dazzling clarity and life-like dimension, placing the viewer directly into the films' incredible settings. Every inch of the colorful reef and every drop of splashing water on the Colorado River's rapids are perfectly rendered, highlighting intricate fine textures and wide, expansive vistas. Likewise, though not quite as sharp or eye-popping as the two aforementioned titles, 'The Living Seas,' 'Journey into Amazing Caves,' and 'Hurricane on the Bayou' also feature very good transfers. Slightly less impressive, however, are 'The Magic of Flight' and 'Dolphins' which feature a comparatively softer and flatter image. With that said, the photography remains impeccable. Colors and contrast are pretty consistent throughout, with pleasing saturation and brightness. Black levels are also solid, though there is some minor pulsing (particularly along the edges of the frame) in darker scenes. A light layer of grain is also visible, but it can look a little static in certain titles, particularly 'The Magic of Flight.' Artifacts are very minimal, but fleeting banding and false contouring does crop up from time to time. Overall, despite some forgivable issues here and there, these really are lovely looking releases that highlight the unique grandeur and spectacle of the IMAX format. The films are all presented with English DTS-HD MA 5.1 tracks. For detailed audio reviews of 'Greece: Secrets of the Past,' 'Mystery of the Nile,' and 'Arabia - 3D' please see their full reviews. Much like the video presentations, the audio mixes here are all rather similar as well, displaying many of the same positives and negatives with only some minor differences here and there. Dialogue and narration are crisp, full-bodied, and clear throughout, conveying all of the majesty and soothing vocal resonance of the movies' different narrators, including the likes of Liam Neeson, Meryl Streep, Robert Redford, and Pierce Brosnan. Music also comes through with impressive fidelity and separation, spreading song selections from Sting, Dave Matthews Band, and Crosby, Stills, and Nash, and an always grand and stirring score from Steve Wood around the soundscape. Effects work is usually surprisingly strong as well, creating convincing ambiance and immersive atmospheres for the films' various settings. Crashing waves, roaring jet engines, pouring rain, and chirping Dolphins all seamlessly move about the room with natural imaging and engaging directionality, surrounding the listener with auditory texture and spacious activity. With that said, not all of the films are as impressive as others. Of the batch, 'The Magic of Flight' and 'Coral Reef Adventure' prove to be the most enveloping, while 'Hurricane on the Bayou' and 'Grand Canyon Adventure' are the most simplistic. Still, all of the mixes do a nice job of complementing the films' gorgeous visuals and there are no notable technical problems or balance issues to report. With a mixture of soothing and stirring music and effects, these tracks do a great job of enhancing the alternately tranquil and rousing imagery found throughout this collection of documentaries. Image has put together a solid collection of supplements for each individual release, including a comprehensive making of featurette for every documentary that traces each film's challenges while expanding upon their content and revealing how all of those seemingly impossible shots were achieved. With that said, with the exception of the cardboard box that houses the individual keepcases, there are no new bonuses or incentives for this 50th Anniversary collection. Making Of (SD, 34 min) - Presented in standard definition with DTS 2.0 audio, this is a behind-the-scenes doc about the film's production with on-set footage and interviews with the crew. MacGillivray-Freeman History (HD, 8 min) - Presented with Dolby Digital 2.0 audio and 1080p video, this is a brief overview of the MacGillivray-Freeman production company, highlighting their filmography while showing off some clips and behind-the-scenes footage. Film Trivia Quiz - Here you can answer quiz questions based on facts from the film. Sample Film Soundtrack - Two tracks in LPCM 2.0 audio by Dave Matthews Band and Steve Wood are included. Learn More - A selection of more text-based facts related to the Water Crisis. The Colorado River & Grand Canyon - More text-based facts about the location. A Message from TEVA (HD, 3 min) - Presented in 1080i this is a short video about the TEVA organization. Water Saving Tips from Kohler (HD, 3 min) - Presented in 1080i this is a PSA about water conservation. Tara's Music Video (SD, 4 min) - A music video for the song "Water" by the band The Engine Room is included. Making Of (SD, 43 min) - Presented in standard definition with DTS 2.0 audio, this is a behind-the-scenes doc about the film's production with on-set footage and interviews with the crew. Making Of (SD, 41 min) - Presented in standard definition with DTS 2.0 audio, this is a behind-the-scenes doc about the film's production with on-set footage and interviews with the crew. Making Of (SD, 32 min) - Presented in standard definition with Dolby Digital 2.0 audio, this is a behind-the-scenes doc about the film's production with on-set footage and interviews with the crew. About the Musicians - Text bios about the musicians featured in film are included. About Audubon Nature Institute - More text based information is included along with links to learn more. About Alligator Stuff - Here we get text info about alligators. Making Of (SD, 34 min) - Presented in standard definition with Dolby Digital 2.0 audio, this is a behind-the-scenes doc about the film's production with on-set footage and interviews with the crew. Making Of (SD, 37 min) - Presented in standard definition with Dolby Digital 2.0 audio, this is a behind-the-scenes doc about the film's production with on-set footage and interviews with the crew. 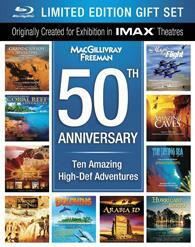 The 'MacGillivray Freeman 50th Anniversary Limited Edition Gift Set' is a solid collection of ten beautifully shot IMAX documentaries. Covering underwater reefs, dangerous ice caverns, massive canyons, desert vistas, and everything in between, these films are packed with gorgeous imagery. The content isn't always as developed as it could be, and some of the movies' stylistic qualities can be a bit overly dramatic, but the footage itself is always impressive. Despite some minor inconsistencies, the video transfers are all strong, highlighting all of the intricate detail captured through the IMAX cameras, and most of the audio mixes offer great music and surprisingly immersive experiences. Each film includes a comprehensive making of featurette, revealing the incredible ingenuity and skill necessary to capture the footage. Unfortunately, outside of the cardboard box that houses the keepcases, this set doesn't offer anything new. Still, this remains an enjoyable collection and it's currently cheaper to purchase this box-set than each individual release. Fans of this style of IMAX documentary should be pleased.